I just came back from Illinois, where I was visiting my sister, bro-in-law, niece, and brand new nephew. Spending time with their newly-turned family of four brought back memories - both good and not-so-good - of the challenging days and weeks after Will and Hallie were born. Most of the parents out there will understand... Back in college you could function fairly well on just a few hours of sleep for multiple nights in a row, but now, after a few years in the real world, you wonder how that was ever the case. At three-weeks-old your bundle of joy is a pretty poor sleeper, and as difficult as it is to acknowledge and accept, you know he's unfortunately still weeks (and weeks may as well be years in the eyes/mind of a sleep-deprived new parent) away from the supposedly blessed six-week-old point at which he will miraculously start sleeping for longer stretches of time at night. You're exhausted. And if this bouncing baby boy is not your first child, you're also pretty tired of juggling the baby's needs against the needs of your older children (let alone your own needs and the needs of your spouse, both of which went out the window an eternity ago). It's difficult to see beyond the next hour, let alone a few months down the road when everyone will be better rested and settled into a routine. This is where my sister and her family are now. They love their beautiful little girl and sweet little boy something fierce, but they're beat. There's very little I can do (especially now that I'm back in Texas), nor is there any advice I can give, to suddenly help the baby sleep longer or them feel more rested. It sounds silly, but whenever I feel lost or helpless and the end is nowhere in sight I turn to Dory, whose words of wisdom have gotten me through some tough times. So for my sister, and for any of you who may be a dark or lonely place, remember how Dory (well, Nemo, with Dory's encouragement) survived. 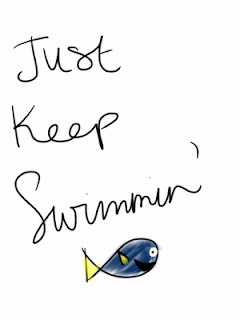 When all else fails...just keep swimming. This fellow's annual "People Are Awesome" video needs only a simple introduction: four and a half minutes of people doing awesome things. We're talking amazing acrobatics, athletic stunts, and Dude Perfect-style shots, nearly all of which will make you gasp, mutter "holy cow" under your breath, or breath a sigh of relief when the risk-taker doesn't die. Enjoy! Do you live there? My in-laws do! In case you missed it the first time around, here's a glimpse into the chaos that resulted with a little critter moved took up residence in Hallie's dollhouse. This post ran for the first time a year ago, but is once again relevant since we all just suffered through another Spring Forward time change. What would you do with an extra hour in your day? Thanks for the words of wisdom - I will try to keep swimming! I appreciate your help more than I can say!